There are a number of health benefits of oil of oregano and medicinal uses for the oregano plant. The ancient Greeks used it as an antiseptic, as well as a treatment for breathing and stomach troubles. Whilst lots of people use the tasty herb for adding zip to their cooking, other folks use it for its host of health and well-being benefits. Originally found growing wild in the mountains of Italy and Greece, the perennial oregano plant grows up to 80 cm's (30 inches) tall, with small leaves carrying the pungent flavour and aroma. Read more about the plant. The small pink or purple flowers are also edible, and look very pretty as a garnish. The best oil is extracted from the small leaves of the flowering wild oregano plant (Origanum vulgare), which is considered to be medicinally superior to other oregano oil varieties. Extraction is difficult and quite a costly process. To produce a single pound of oil, you have to use 100 pounds of the herb! The leaves are also super healthy and worth growing for use in your recipes. Here are tips on growing oregano. Quality oregano oils contain 75% to 85% of the active ingredient carvacrol which has potent anti-inflammatory and antiseptic qualities. 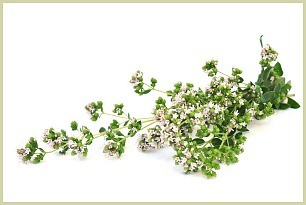 Note: Wild oregano oil can be powerful stuff and you may need to mix it with olive or coconut oil to dilute it a touch. But as always, it's advisable to follow the instructions on the bottle. ...A way to enjoy some of the benefits of this healthy herb is to make a drink from the dried or fresh leaves. Click for my oregano tea recipe.